Come Play In The GameZone At XtremeCraze! The GameZone is designed for all ages and includes the best-of-the-best video, sport and redemption games created. From test-your-skill games like Skee Ball and Basketball to dual interactive video auto racing games and Smoken Token, there's something for everyone! Our XtremeCraze Family Entertainment Center has a huge range of fun-filled indoor activities. 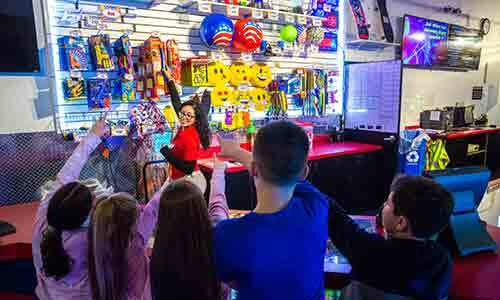 Our game zone appeals to kids of all ages and physical abilities. And grown-ups get to pretend they're not so grown up after all! After you've made your mark, redeem your tickets from those points-for-playing games for a wide variety of unique fun prizes at the XtremeCraze Prize Center. HAVE FUN IN THE GAME ZONE!